When Nebraska hired Scott Frost, there was little doubt that he would be bring his up-tempo offense to Lincoln. The offense is a blend of the lethal Oregon offense made famous by Chip Kelly and the old-school Husker Power Tom Osborne offense. With a new offense comes new positions for fans to get acquainted with. One new position for Nebraska fans is the “Duck-R” position on offense. While the position created good offseason message board fodder, it is also critical in keeping the Huskers attack as versatile as possible. The ability to have a player on the field that can both run the football out of the backfield and catch the ball is a great luxury that would allow Nebraska to play even faster and not have to substitute. Last season at Central Florida, Otis Anderson was in that role for Frost and his staff. As a true freshman, in 2017 Anderson had 69 rushing attempts for 494 yards and four touchdowns to go along with 30 receptions for 351 yards and three touchdowns. One player that running backs coach Ryan Held has had high hopes for in the Duck-R position is freshman Miles Jones. In the spring before Jones arrived, Held mentioned him as a player that could have an impact at that position. Now that Jones is on campus? “Miles Jones has really come along,” Held said. “He’s had a good three days to be honest with you. He was dinged up a little bit. He has a chance to help us. It’s another weapon in our recruiting that we went out and got a guy that can run. He’s a guy that can play that Duck-R, running back/receiver spot. I’ve been playing him more at the running back because he gives us another home run threat in my room. It creates more competition in my room. In the spring, Held mentioned Mikale Wilbon, Greg Bell and Wyatt Mazour as players that were getting work at the Duck-R position before Jones' arrival. Since then, one player has risen to the top at the position. “Wyatt Mazour. He’s been a little banged up but he’s building back up," Held said. "He did more today and I expect him to do more tomorrow and Friday. He’s a guy that’s worked receiver and running back. To be honest with you, those are our two guys that fill it. The other guys are more tailback type guys. We are very talented with JD [Spielman] and Tyjon [Lindsey] and some other guys that can do it too. We don’t want to try to force that. We want it to make sense because we want to get our best players on the field. We don’t have to be in “duck personnel” just to say we are doing it. As Held said, the Huskers won’t put “duck personnel” on the field in 2018 if they don’t feel comfortable with the players they are giving reps to. 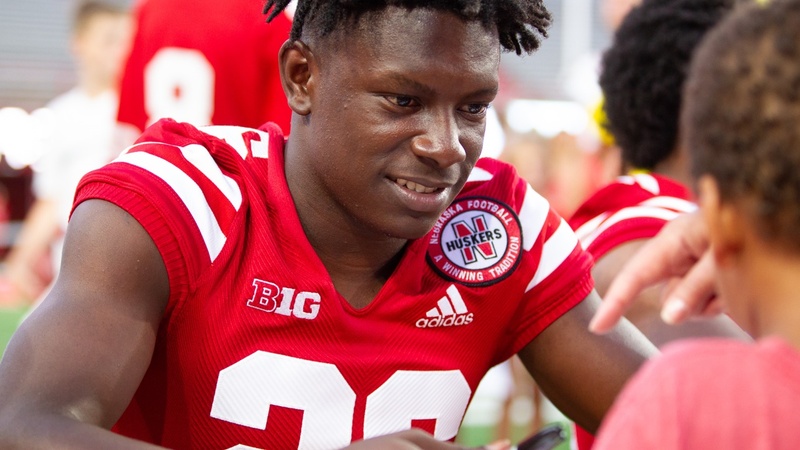 As for the future, 2019 running back commits Ronald Thompkins and Rahmir Johnson both have the ability to run and catch the ball, making them possibilities at the Duck-R position at Nebraska. Besides those two, the Huskers are after a few versatile backs to add to the roster. Frost’s offense will continue to evolve in the coming seasons, especially as the staff finds the right blend of playmakers to operate it efficiently.